Accepted Scientific Name: Mammillaria wrightii Engelm. Origin and Habitat: New Mexico as well as Sonora and Chihuahua, Mexico . Type locality: Anton Chico on the Pecos east of Santa Fe, New Mexico. Habitat: It grows in gravelly or sandy hills or plains, desert grasslands to pinyon-juniper and surrounding areas. 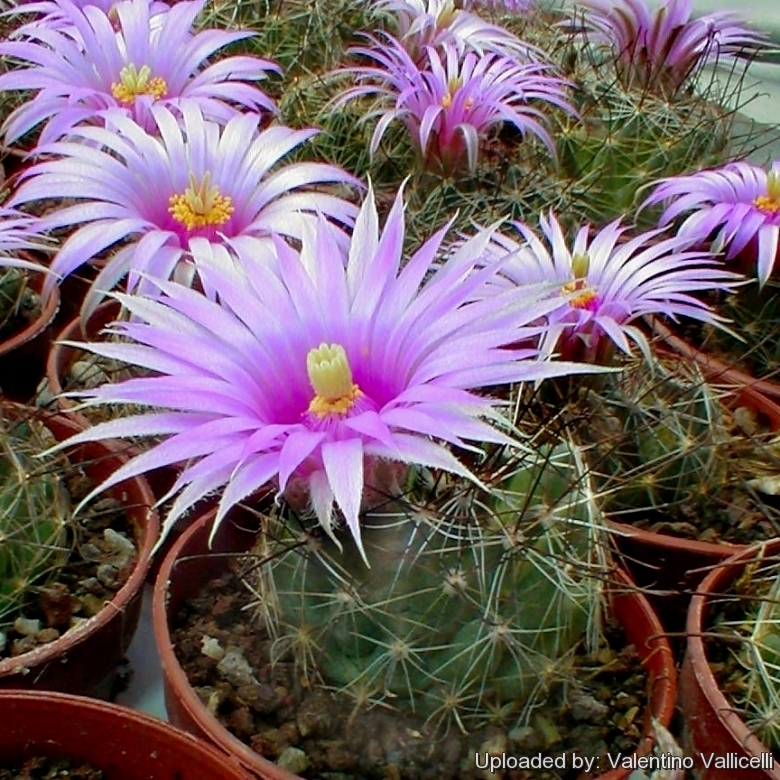 This species is often found among grasses in association with other plant species, including Echinocereus polyacanthus amd Mammillaria saboae v. haudeana. Mammillaria wrightii is superficially similar to Mammillaria grahamii and the two species overlaps in the Franklin Mountains in New Mexico. 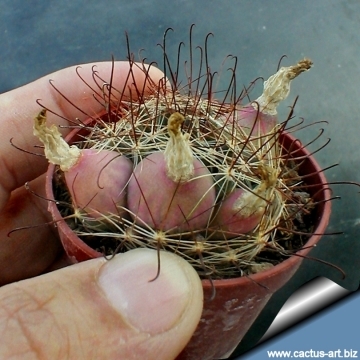 Description: Mammillaria wrightii is tiny soft-bodied cactus species with short, white dense spines growing parallel to the stem, partially hiding it. Its central spines are few, long, dark and hooked. Wondrous flowers, large and red-purple to magenta, appear in late summer followed by large palatable, grape-shaped fruits. Habit: The stem of this jewel is simple usually unbranched,. Stem: Depressed-globose, to short cylindrical, dark green, 3-8 cm in diameter and 4-8 cm tall aboveground when expanded during moist periods, but during drought periods the stems become flat-topped and shrink to ground level, in part the result of a prolonged underground base. Tubercles: Cylindrical, terete, flaccid, without latex, up to 12 mm long, with naked axils. Areoles: Circular with short white hairs. Central spines: usually 2-3 (less often 1-4 or more) , stouter than the radials, sometimes 2 or 3 hooked at apex stiffly spreading (6-)12-14(-20) mm long, reddish-brown, black or black-and-white. 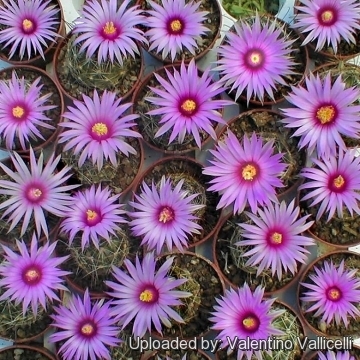 Flowers: Large for a Mammillaria, rose-purple or magenta (rarely white), typically 2,5-4 cm long and 2,5-7,5 cm in diameter when expanded. The outer perianth-segments about 13, triangular-obtuse, prominently fringed; inner perianth-segments bright purple. Perianth parts reflexed.The anthers are bright yellow. The style is greenish, pinkish above, supporting 7-11 stigma lobes that are yellow or pale green, or rarely reddish. 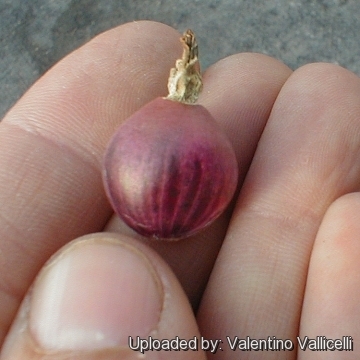 Fruits: Globose or ovoid, previously described as "grapelike," usually are 1,3-2 cm long and 12-25 mm in diameter, green or dull purple, very juicy, and differ conspicuously from the elongate, bright red mature fruits of Mammillaria grahamii. Phenology: In general Mammillaria wrightii flowers in habitat in the summer following rains and fruits during the autumn. 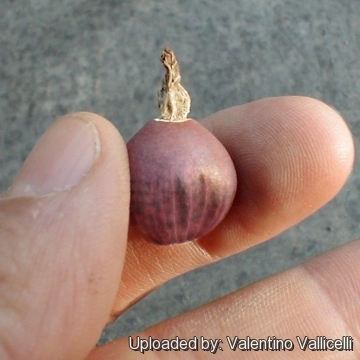 Sterile and Immature Specimens: Young seedlings may have only one hooked central spine per areole and at least two hooked centrals per areole usually are present in juveniles specimens with a stem diameter of more than 1 cm. Notes: The showy flowers of Mammillaria wrightii are virtually identical to those of Coryphantha macromeris and Escobaria vivipara; in the absence of vegetative material, flowers may be unidentifiable. 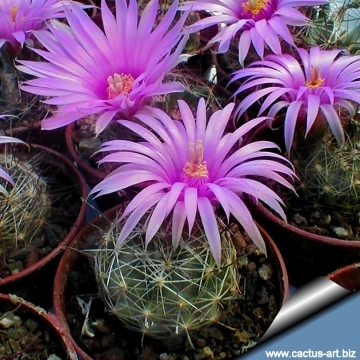 Cultivation and Propagation: Mammillaria wrightii is a single stemmed species that comes from an area of summer rainfall. It is quite cold resistant, but the frost resistance varies a lot from clone to clone. It can easily be grown outdoors in areas with minimum winter temperatures of -15° C. It needs full sun to light shade.